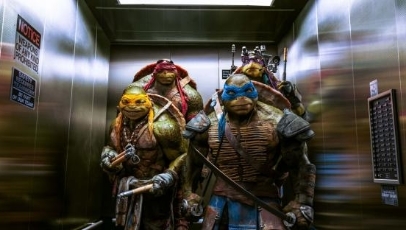 An up-to-date reworking of the titular heroes in a half-shell, Teenage Mutant Ninja Turtles is derivative and irksome in equal measures – unsurprising considering Michael Bay’s involvement as producer. In her hunt for a big story, plucky reporter April O’Neil (Megan Fox) stumbles upon four crime-fighting mutated turtles – Leonardo (Johnny Knoxville), Raphael (Alan Ritchson), Michelangelo (Noel Fisher) and Donatello (Jeremy Howard) – who are out to stop the evil Foot Clan in their tracks. Predictable to its paper-thin core, Teenage Mutant Ninja Turtles is nothing more than a haphazardly constructed eyesore designed to pound the senses silly, rather than entertain them. Aside from one moderately thrilling mountainside set piece that provides a brief distraction midway through, the action is not only dumb, but also obscured by Jonathan Liebsman’s over-the-top, oppressed directorial style, and the CGI work – particularly of the turtles themselves, who are badly etched out in every way – is only ever passable at best. It’s difficult to watch a piece of your childhood laid to waste in such a careless, monotonous manner, but that’s exactly what Teenage Mutant Ninja Turtles does. And the worst part is that some will absolutely lap it up.